TrelleborgVibracoustic supplies the Porsche Macan’s optional air springs, which allow the crossover to sit 15mm lower to the ground than with a steel-spring suspension. The lower ride helps reduce fuel consumption and CO2 emissions by more than 5 percent, the Germany-based supplier said. German partsmaker Hengst supplies the Macan’s 3.0-liter gasoline engine with its V-Space module. This multi-functional, integrated plastic module performs five separate functions: crankcase cover; free-form coolant distribution channels; crankcase pressure control valve; crankcase system with air intake and ventilation system; and oil mist separation with multicyclone and pressure regulating valve. Because of the use of high-grade plastics, the module can withstand the temperature demands associated with ventilation. Using a smaller pressure control valve with advanced projection capabilities also means that the valve can be protected from freezing. The new Macan is assembled alongside the Cayenne and Panamera at Porsche's factory in Leipzig, eastern Germany. 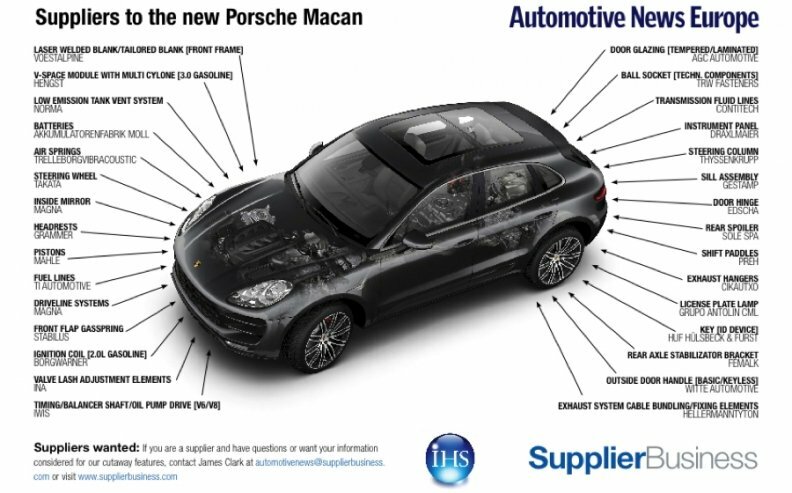 Macan output is forecast to peak at more than 80,000 units in 2016, according to IHS Automotive.